Caroline Mosser is an educator, translator, writer and independent scholar. She has lived and worked in both France and the United States, and is looking forward to more adventures. After earning her Ph.D. in Comparative Literature from the University of South Carolina, she has taught French as a postdoctoral fellow at Utah State University. As a graduate student, she participated in and taught for the competitive Social Advocacy and Ethical Life scholarship program at USC. 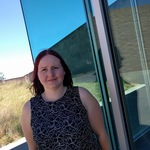 Having always been fascinated by both the sciences and the humanities, she has focused her work on their connection through the study of the representations of science and technology in popular culture. A life-long learner, she enjoys sharing her knowledge through teaching and participating in various academic and cultural projects (such as translating, interpreting, and editing). Throughout my academic career, I have been teaching courses in French and English and am comfortable with both languages. I present myself as a mentor to students. Because I believe that teaching is a collaboration between instructor and students, I include open-ended assignment in which they explore their own interest and how it relates to our class. In a basic French-language course, I focus on creating a safe environment where students feel comfortable to participate. Being a native speaker of French, I use my experience of learning English to relate to my students and build a two-way conversation. I tell them on the first day of class that they can correct my English. Students have reacted positively and tend to feel more comfortable expressing their difficulties. I also privilege positive feedback, using an informative rather than corrective feedback policy, and metalinguistic feedback allowing students to figure out their mistake. As a facilitator, I use mostly French in order to build students’ ability to understand the language through contextual clues. I use cultural or personal artifacts to provide visual clues and authentic examples. For instance, when teaching about food, I use menus from French restaurants, asking what they would like to order, which ingredients they expect to find, leading to a discussion comparing what is offered in their favorite restaurants and what they would recommend. In the case of a higher level French-language class, I privilege contemporary material because it is more relevant to students as they include structures and vocabulary likely to be encountered outside of the classroom. Students reflect on language as form and meaning in context and finally, produce their own texts. Doing so allows me to start a discussion on how ideas can be represented differently. It allows us to discuss how meaning can take many forms. Language and literature courses are often criticized for not being practical or for being too focused on textbooks. I disagree. These courses are windows to a world of possibilities and it is my responsibility to make sure that students are able and willing to open them. Quels sont les points de la grammaire française que vous trouvez les plus difficiles et pour lesquels vous voudriez avoir des conseils/explications ? Quels sont les films ou séries français(es) que vous aimez regarder pour pratiquer votre français ?